The day continued to be awful. When I stopped shaking, I got back on the Vespa and onto a long flat road through the countryside and into farming land. The day had gotten hot, I presumed it was over 100 degrees. Feedlots lined the road, crammed with cows standing in the dirt like lost souls in limbo. Their stench hung in the hot air; when semis passed in the opposite direction, the furling air and horrible smell conspired to knock me off my ride. Overwhelmed, nervous and lost, I wondered what the hell I was doing. As the feedlots faded down the road behind me, traffic dissipated and thousands of tiny yellow butterflies whirled and danced in the air for one long stretch of the road. A beautiful sight - but tears fought for release as the butterflies splattered against my Vespa, against my face shield, against my jacket; unavoidable deaths because of their number. Soon I reached the cities of the Central Valley and traveled surface roads north to Sacramento. A bank sign in Stockton showed the temperature was 109. I was dripping with sweat in my black leather, and forced myself to drink a sip of water at each stoplight, wondering when, when, would this day end? When would I finally reach Sacramento and my grandmother's little trailer? When I did reach my grandmother's home, I opened the door and fell to the floor, unable to walk or move, and sobbed out all the overwhelm and stored fear and self-pity. I truly believed that day might be both the first and the last day of my trip. It was a day that lasted ten, and though I couldn't possibly fathom it at that point, I would soon learn with delight they all would be. On the first day of the trip, I rode from the Bay Area to Sacramento, CA, and it was unequivocally one of the worst, most horrific days of my life. It began soft and wondrous, setting out into the unknown adventure in the misty dawn, a scattering of stars still visible. The day grew light and warm as I rode past the cities and the suburbs to where the land opened up and the scent of sage was heavy in the air. To get to the Central Valley and Sacramento, I had to cross the Diablo Range, a small range - certainly not mountains in the Western sense. I was too busy worrying about having to cross the Sierras the following day to give any fear to my morning's ride across the Diablos. I-580 is the main route of travel between the Bay Area and the Central Valley, but since I wanted to stay off the interstate, I chose what appeared to be a rather obscure secondary highway. I approached this little highway via a lovely wooded road with no traffic, calm scenery and lots of birds. I was feeling so good, so in control, so right on the road. Things changed in an instant. The moment I turned onto the highway I was swept into chaos, into conditions of insanity - at least for me, on day one, on my tiny Vespa. The highway itself was a two-laner, one lane for each direction and no divider in between. It wound up steeply in great sweeping curves, following the landscape of the dry hills, and it was packed with cars, trucks, and semis rushing in both directions. Hypnotic golden hills of windmills rolled like waves in every direction, growing and dropping, overlapping to the blue-sky horizon. The huge spires of the windmills grew out of the ridges of the hills like rows of giant white flowers, their petals giant blades, spinning, mesmerizing. 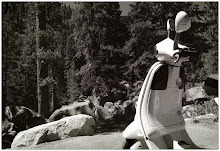 I pushed the Vespa to 70 mph in an attempt to keep with the flow of traffic - at that speed, I felt like I was going to take flight, and still I was not going fast enough for the drivers behind me. There were no turn-offs, no shoulder at all; there was nowhere to go but straight ahead and straight ahead was a curve. A semi grill loomed enormous in my rearview mirrors, racing down the declines just feet behind me. One wrong move or jerky turn or hesitant reaction and I knew I would be laid out in a crash, the semi on top of me in a semi-second. I nearly threw up inside my helmet twice from fear and desperate helplessness, and I could feel the moment when pure animal survival-instinct stepped in to overcome my rising panic and simply keep me upright. When we reached the Valley, the highway leveled out and I spotted a fruit stand. I pulled over, parked, and stood beside the highway, shaking. After a stint in San Fran, I decided to move back to New York City; 'why not get there by Vespa,' I thought. Once I got to NYC, the country had put its spell on me, and I promptly moved to Wyoming instead. You can also find me at The Daily Coyote and Honey Rock Dawn. Joy, freedom, faith.... sometimes these essentials gray out, fade, in the rush of society, normalcy, shoulds. For two months I lived outside of all that, lived fully immersed in the thrill, the ecstasy, the unknown. And it was divine. 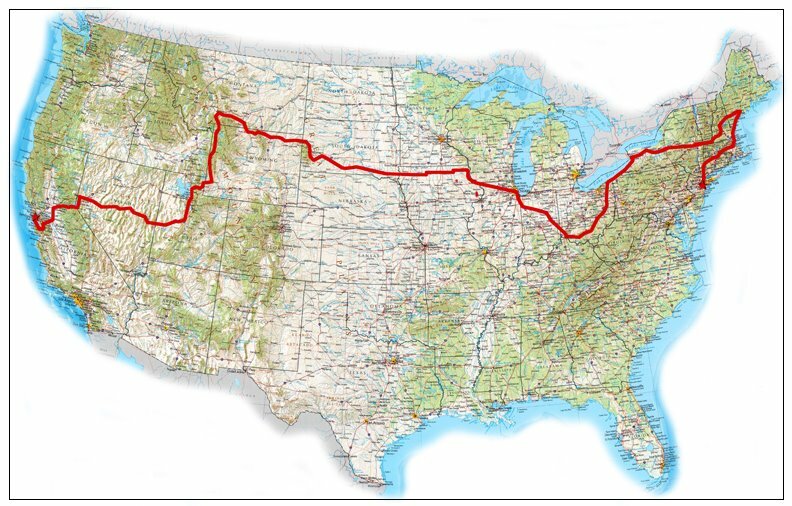 This site recounts the ride - August 1st to October 1st 2005 - and all that I thought and saw and did. ©2006-2011 Shreve Stockton. Powered by Blogger.